What is the $1 million reason to change your mind? Change the way you think and you will change your world. Simple. 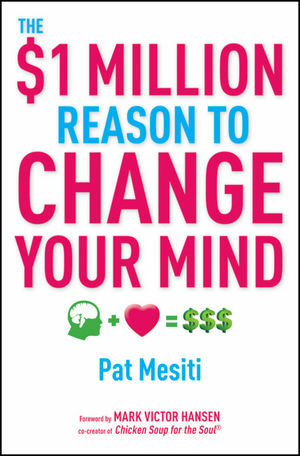 In this book Pat Mesiti will teach you how to shrug off the shackles of mediocrity, find your inner millionaire and think differently about life and money -- and get rich and happy along the way! "Soak up what Pat Mesiti has to say -- all he wants to do is share his prosperity and teach you about the millionaire mindset. Then, apply it to your life and watch it improve. Simple as that." "Pat Mesiti is dedicated to unlocking the potential inside of people, and opening up their minds to a more rewarding, fulfilling and prosperous future. And in this book he shows you how." "This excellent and highly recommended book will make you laugh, cry, feel encouraged and forever change your life for the better." Pat Mesiti's catch phrase is 'Building lives 24/7'. And following a violent upbringing in a rough Sydney suburb, co-founding Australia's richest – and most controversial – Pentecostal church, and running charities Teen Challenge and Youth Alive, that is exactly what he's dedicated his life to doing. Pat believes we can all be rich, that it's just a matter of shifting one's mindset to that of a millionaire. He has spent the past ten years sharing his income acceleration theories to captive audiences across the globe, and helping to build some of Australia's largest people organisations. As one of the world's most celebrated motivational speakers, Pat has shared the platform with the 'big guns' of the industry, including Donald Trump, Denis Waitely, Robert Kiyosaki, Mark Victor-Hansen, Jim Rohn, Charlie Tremendous Jones, Captain Jerry Coffey, Alan Pease, Bob Proctor, Willie Jolley and Morris Goodman 'the miracle man'. His 'millionaire mindset' bootcamps sell out internationally, and his 'teaching resources' (self published books, CDs and DVDs) have sold over 2 million copies worldwide. Pat's appeal is his humour, humility and humanity. His stories are at once funny and poignant, his energy contagious and inspiring. His down to earth approach and the wisdom gained through the many challenges of his own life and those he has helped ensure that he will engage readers far and wide. Pat is currently the Australian real estate industry's key consultant on enhancing sales performance, and he recently toured the US to speak to massive crowds for Amway, Internet Services and ALFLAC. His international speaking commitments are many, so his access to global markets wide. Chapter 1 Do you have a mind virus? Chapter 2 Changing direction to head for prosperity. Chapter 3 Your thoughts become your actions. Chapter 4 Developing a millionaire mindset. Chapter 5 Climbing those walls in your mind. Chapter 6 Developing a healthy view of yourself. Chapter 7 The 10 key characteristics of a millionaire mindset. Chapter 8 Fixing your attitude to money. Chapter 9 Make failure your teacher. Chapter 10 Know what you want. Chapter 12 Growth happens by choice. Chapter 13 How to make good decisions. Chapter 14 Get some help! Chapter 15 Aim for the stars. Chapter 16 Fuel your dream with passion. Chapter 17 Fuel your passion with a reason.